This is the first part of an eight part series focused on pregnancy. Over the course of the next several months, subject matter experts from Landstuhl Regional Medical Center will provide information on things families can do to enhance their pregnancy experiences in addition to the types of programs, services and care options available at LRMC. For many military families who move overseas, the thoughts of travel, adventure, food and culture is enough to fill even the busiest of weekend calendars. From planning trips with friends to mapping the abundance of castles and Roman ruins, there is no shortage of activities for those who enjoy the thrill of new experiences. However, there are also military families whose calendars are set around ovulation and menstruation; the hopes of pregnancy and a new baby take priority over nearly everything else. "Wanting a baby is a strong, natural emotion and some couples get frustrated quickly when trying to conceive," said Maj. Molly Kern, an obstetrician and gynecologist at Landstuhl Regional Medical Center. "Statistics show that even when everything is completely normal, couples can actively 'try' for 12 consecutive months before a baby is conceived." That strong desire to grow a family is the reason that LRMC offers programs and services for couples who are eager to get pregnant. "For many couples, their journey toward conceiving a baby started well before the military assigned them overseas," said Kern. "The ability to offer those couples resources to continue that journey is something that we are very proud of." LRMC offers infertility counseling and evaluation through the Department of Obstetrics and Gynecology for couples who have been actively trying to conceive for more than 12 months. As part of the consultation, providers like Kern will ask about a patient's medical history, previous use of birth control and any genetic concerns. 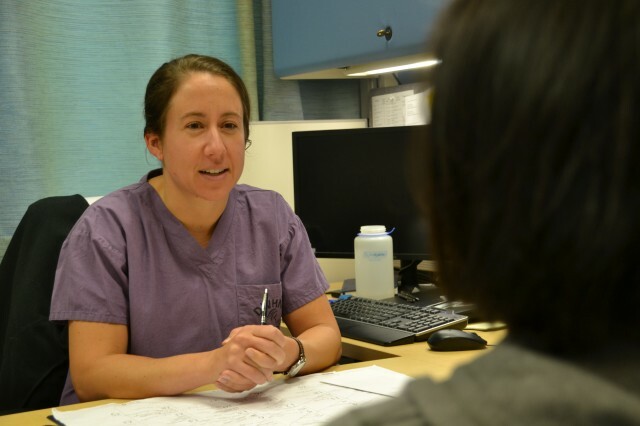 In addition, patients are asked to provide blood samples and run through a series of radiology examinations, receive medical advice and potentially a prescription for ovulation induction medication. According to Kern, a woman's body may require a considerable adjustment period after stopping birth control medication. The LRMC infertility counseling includes discussions on the type of birth control previously used and tips to help the body adjust and begin ovulating on a regular frequency. "Many women also suffer from fibroids, or benign uterine muscle growth, which can impede conception," said Kern. "LRMC can help manage those cases surgically." Diet and exercise are critical for women who are trying to get pregnant. Eating healthy and exercising three to four times a week can greatly improve a woman's chances of conceiving. In addition to consistent exercising, having a body mass index of less than 25 will improve a woman's chance of getting pregnant. Smoking can affect fertility and the fetus when a woman gets pregnant. Prenatal vitamins provide folic acid and other nutrients that assist with fetal development. Trying to conceive can be tough for relationships. During the infertility counseling, patients are encouraged to ask their OB/GYN provider for a referral to behavioral health for assistance in improving struggling relationships. Conceiving a child is harder for women over the age of 35, so patients who fall in to this category are encouraged to schedule a preconception or infertility counseling appointment sooner rather than later to discuss medical options. For some couples, conceiving is still difficult even with the most stringent adherence to these recommendations. "If, after a certain time period, the couple still has not been able to conceive, we may look at options like fertility intervention," said Kern. "The good news for us in Germany is that services like in vitro fertilization are cheaper than in the States, which may have been a huge barrier for couples wanting a baby." Some LRMC patients who are TRICARE beneficiaries may be eligible for financial assistance for fertility programs. TRICARE will cover some associated costs for fertility programs if the services are considered medically necessary. Patients can log on to www.tricare.mil and search for "assisted reproductive services" for more information. Some services may require a referral. "As an OB/GYN doctor who has the honor of delivering babies here at LRMC, there's something magical about seeing the look on a new parent's face when they hold their child for the first time, especially when I know how hard they have tried to get pregnant," said Kern.